Drexel University students are making sure their degrees work for them. Last year, at least 90 percent of the student body participated in cooperative education before graduating. The off-campus, professional-level employment aligned with their academic interests and allowed students to work six months up to three times during their college career. It also helped graduates land jobs in their chosen career field as 44 percent of 2012 co-op participants were offered jobs by former co-op employers. In 2010, a Federal Reserve Bank of New York study found that, though more than 62 percent of jobs required a degree, only about 27 percent of graduates worked in a field closely related to the major. Such research, which does not include graduate school students, is becoming increasingly more important in conversations about the value of a higher education. As college tuition costs rise, more students, parents and taxpayers are asking institutions to show a return on the financial investment. They are calling for more data to assess whether a college education can deliver the high-paying, professional positions graduates seek in their chosen career fields. In May, a bipartisan group of senators and representatives introduced legislation that will arm students and parents with better data to make informed decisions. The Student Right to Know Before You Go Act aims to make higher education value and outcomes information more transparent. It will merge state and school data about graduation rates, job placement rates and a graduate’s ability to pay back loans online where it can be easily accessed. 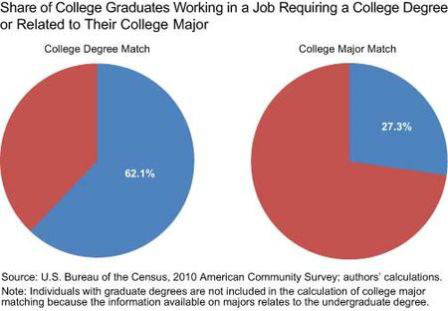 In the real world, the number of occupations exceeds the number of degree options, so students need transferrable skills. Human resources and career placement professionals recommend that institutions equip students with business and life skills that prepare them for different occupations and various areas of life. Changing careers will also become a constant for the present generation—with up to nine careers expected in their lifetime, said career coach J.T. O’Donnell. Half of tomorrow’s career options may not exist today, she added, so being flexible will prove valuable. Students will need universal skills that can grow and adapt as the world does. College Career Service Centers can help equip students for the changing and demanding workforce and bridge the gap between academic and career success. The centers vary widely in terms of staffing and digital resources, but generally outline the steps students should take and offer training in business communication, resume writing and presentation skills. They can also provide information about internships and co-ops that give student valuable work experience. O’Donnell recommends that schools invest more funding in the career centers, especially in technology, and develop mandatory curriculum that includes career assessments and business skill development. They should also require internships or work experience before graduation.